Jesus had predicted his passion and death – and that those predictions have come to pass is all too apparent to the small community of disciples sequestered away in the upper room, unsure of all that has passed, and even more unsure of what awaits them. But Jesus had also predicted his resurrection. In this Lucan narrative Jesus manifests himself not only to selected individuals (vv. 31, 34) but to the whole company of his followers. Their reaction is less than stellar: But they were startled and terrified and thought that they were seeing a ghost. Only in the later Lucan account of the Ascension (vv.50–53) do fear, amazement, and doubt (vv.37, 41) give way to worship, great joy, and obedience. Lest we import our own post-Resurrection understanding on this story, we are wise to let the account tell us what is unfolding. The disciples have heard of several encounters with the Resurrected Jesus. The disciples from the Emmaus road have returned to proclaim: “The Lord is risen, indeed!” (v.34). 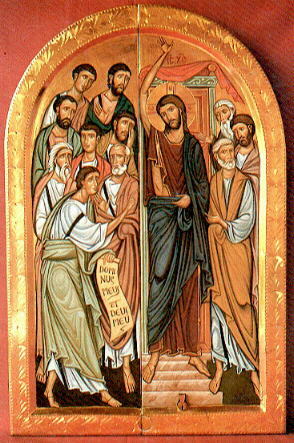 And when Jesus appears in their midst and speaks words of peace (v.36), their response is “But they were startled and terrified and thought that they were seeing a ghost” (v.37) In that moment their posture of faith is revealed as an “half-finished” faith – they do not accept the whole of Jesus’ teaching concerning how the divine purpose would be fulfilled in him. Thus, in this account, Jesus undertakes to unveil the truth of his resurrection in several ways—the first two oriented toward underscoring the materiality of his continued existence (vv.38–43), and the latter concerned with its scriptural significance (vv. 44–49). Fearing where angels tread. The report that Jesus “stood” among them echoes the language of OT angelophanies (Gen 18:2; 1 Chr 21:15–16; Dan 8:15; 12:5; Tob 5:4; cf. Num 22:22–24; Luke 1:11; Acts 10:30). Apparently they recognize the one before them as Jesus, but are not ready to accept that he could have any form other than an intangible one. It should not be surprising that the disciples are “startled and terrified.” They think they are seeing a ghost (v.37, 29). These are the only places where pneuma (spirit) is translated “ghost”. Their terror (emphobos) is consistent with seeing an angel. That is the reaction of the women at the tomb at seeing the “two men in dazzling clothes” appearing before them (Luke 24:5) and the reaction of Cornelius at seeing a vision of an angel of God coming to him (Acts 10:4). When an angel appeared to Zechariah, he is terrified (tarasso) (1:12), the same word Jesus uses of the disciples, “Why are you troubled?” (24:38). In contrast to the popular notion of a comforting guardian angel, the presence of these divine beings produced great terror and fear in those who saw them. Except for coming to Jesus in the garden (22:43), every other time angels (aggelos) appear, they say, “Don’t be afraid” – to Zechariah (1:13); to Mary (1:30); and to the Shepherds (2:10). This entry was posted in Scripture and tagged Luke 24:35-49, Resurrection by Friar Musings. Bookmark the permalink.